Don’t worry if taxes are leaving you feeling ravenous. 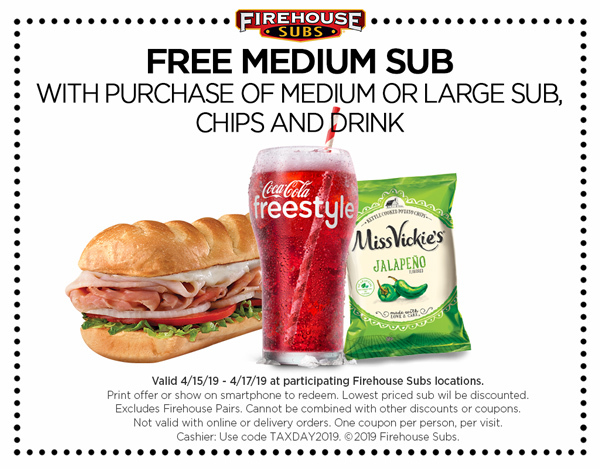 Just stop by your Firehouse Subs and order a large or medium sub, chips and drink to receive another medium sub free! Don’t forgot to also show your coupon to redeem your free meal. Call ahead to make sure they are participating in this special. It might also help to save some time. Order a full-priced large or medium sub, chips and drink. Show a printed version of this coupon or just show the coupon using your smartphone. * US only. At participating stores. Valid April 15-17, 2019. Purchase required. Coupon valid for in-store purchases. Limit of 1 coupon per person per visit.